In large bowl, stir cookie mix, butter and egg until dough forms. Divide dough in half. Stir cocoa into one half. Stir flour, mint extract and food colour into other half. Place chocolate dough on 17x12-inch sheet waxed paper. Top dough with second sheet of waxed paper. Roll dough to form 12x7-inch rectangle. Repeat with green coloured dough. Remove top sheet of waxed paper from both doughs. Using waxed paper to lift green dough, invert onto chocolate dough. Gently press layered dough to 14x8-inch rectangle. Remove top sheet waxed paper. Use bottom sheet waxed paper to help roll doughs up together tightly, beginning at long side. Wrap tightly in waxed paper; freeze at least 2 hours or until very firm. Heat oven to 375°F. Unwrap dough; cut into 1/4-inch slices. Place slices about 2 inches apart on ungreased baking sheet. Bake 9 to 11 minutes or until set. Cool 2 minutes; remove from baking sheet to wire rack. Cookie dough can be covered and refrigerated up to 24 hours before baking. Each time you slice a cookie, roll the dough a quarter turn to prevent flattening on one side. 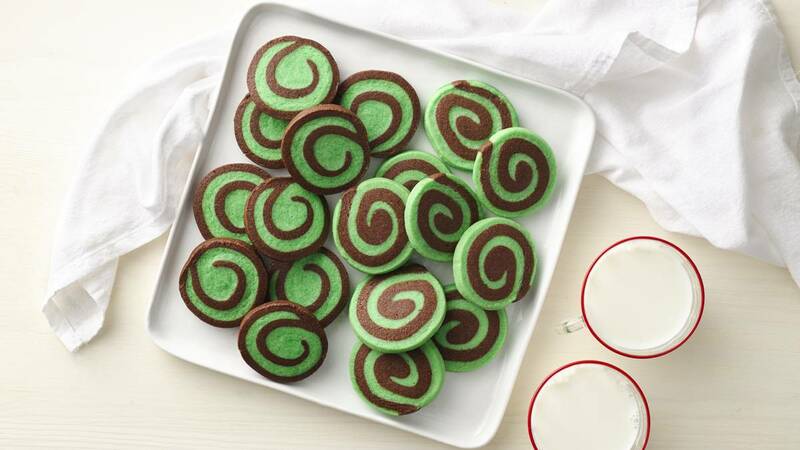 Put a different spin on these cookies by reversing the chocolate and mint dough layers.